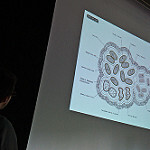 bit.ly/dmi18-ws-call Call for participation and general information. bit.ly/dmi18-ws-welcome-folder Main welcome package documents. This includes: a welcome note, general information, the day-to-day schedule, and a map of venue locations, coffee, and lunch places. bit.ly/dmi18-ws-schedule Day-to-day schedule for the Winter School. bit.ly/dmi18-ws-reader-folder Reader for the Winter School (for participants and students) and a folder with PDF files. 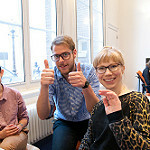 bit.ly/dmi18-ws-projects Descriptions of projects to be pitched on the opening day. bit.ly/dmi18-ws-facebook Face book of all participants. bit.ly/dmi18-ws-notes Collaborative note-taking for the keynotes on the opening day. #dmi18 Don't forget to tweet. 4 Retraining the machine? BG1 0.14 Retraining the machine? ** Please find a list and map of venue locations in the welcome package (section IV). The Digital Methods Initiative (DMI), Amsterdam, is holding its annual Winter School on 'the Social Lives of Digital Methods: Encounters, Experiments, Interventions.' 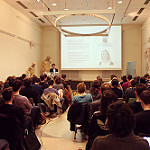 The format is that of a (social media and web) data sprint, with hands-on work for telling stories with data, together with a programme of keynote speakers and a Mini-conference, where PhD candidates, motivated scholars and advanced graduate students present short papers on digital methods and new media related topics, and receive feedback from the Amsterdam DMI researchers and international participants. Participants need not give a paper at the Mini-conference to attend the Winter School. For a preview of what the event is like, you can view short video clips from previous editions of the Summer School in 2015 and 2014. Over the past decade digital methods of various kinds have been put to use by data journalists, national ministries, non-governmental organisations, city governments, media artists, police departments, international organisations, philanthropic funding agencies in the service of a wide variety of projects and objectives. Within the academy digital methods have spread from researchers of the internet, new media and computational culture, leading to encounters and experiments with a wide range of disciplines in the humanities and social sciences, working with their own publics, partners, questions, concerns and modes of inquiry with and about the digital.. That one may intervene with digital methods is clear, but the question concerns the positioning. Extremism and counter-terrorism units may wish to map online networks of groups and individuals. Under which circumstances and with which ethics to act? City governments may be interested in how to use platform data to inform their responses to emerging “gig” and “sharing” economies said to be changing the character of housing, transport and work. When an analyst finds concrete instances of over-renting properties, does one share the findings and if so how? Non-governmental organisations would like to know whether their anti-fossil fuel campaigns are reaching audiences outside of their own bubbles. How to make such questions relevant for academic research? Funders would like an issue area and the stakeholders mapped, but what if one finds that the funders are overdetermining the agenda of the field? How might the style of digital methods work on secure messaging apps vary, depending on whether the audience is critical media scholars, privacy advocates or public institutions? Researchers in fields such as science and technology studies and ethnomethodology have long pointed out that methods are not only used by researchers to study social life, they are also a part of social life (see, e.g. Garfinkel, 1984). This notion has been further elaborated and explored through a more recent agenda on the “social life of methods” (Ruppert, Law, & Savage, 2013). Digital methods and data projects can be used to create not only novel styles of analysis, but also different kinds of “interactivity” (Marres, 2017) – from involving those who are researched in the research process, to different forms of participatory design, public involvement and experimentation. Such encounters may produce changes in the analytical interests and approaches of both researchers and practitioners, and may be considered a substantive part of the research process, rather than a communicative afterthought. At the 2018 Digital Methods Winter School we would like to put forward positioning practices that address working with practitioners together with the projects (and data sets) they bring along. The Winter School has as its goal to take stock and tell stories of interventions and the positionings one was able to take up. How to navigate the space between scholarly research, practitioner expectation and critical output? Additionally the Winter School will make interventions, working together with ‘publics with an ask’. Garfinkel, H. (1984). Studies in Ethnomethodology. Cambridge, UK: Polity Press. Marres, N. (2017). Digital Sociology: The Reinvention of Social Research. London: Polity Press.
. To attend the Winter School, you need not participate in the mini-conference. The full program and schedule of the Winter School and Mini-conference are available on 4 January 2018. If you would like to have accommodations at the Student Hotel, please write to the student hotel directly. To avoid disappointment, please write to them as early as possible. Ask the hotel for the Digital Methods Winter School discount. The Winter School closes on Friday with a festive event, after the final presentations. Here is a guide to the Amsterdam new media scene. For further questions, please contact the local organizer, Fernando van der Vlist at winterschool [at] digitalmethods.net. The Digital Methods Winter School is part of the Digital Methods Initiative (DMI), Amsterdam, dedicated to developing methods for Internet-related research and the study of the natively digital. The Digital Methods Initiative holds the annual Digital Methods Summer Schools (ten to date), which are intensive and full time, 2-week undertakings in the summertime. The 2018 Summer School will take place from 2–13 July. The coordinators of the Digital Methods Initiative are Dr. Sabine Niederer (Amsterdam University of Applied Sciences) and Dr. Esther Weltevrede (New Media & Digital Culture, University of Amsterdam), and the director is Richard Rogers, Professor of New Media & Digital Culture, University of Amsterdam. Digital methods is a term coined as a counterpoint to virtual methods, which typically digitize existing methods and port them onto the Web. Digital methods, contrariwise, seek to learn from the methods built into the dominant devices online, and repurpose them for social and cultural research. That is, the challenge is to study both the info-web as well as the social web with the tools that organize them. There is a general protocol to digital methods. At the outset stock is taken of the natively digital objects that are available (links, tags, threads, etc.) and how devices such as search engines make use of them. Can the device techniques be repurposed, for example by remixing the digital objects they take as inputs? Once findings are made with online data, where to ground them? Is the baseline still the offline, or are findings to be grounded in more online data? Taking up these questions more theoretically (but also practically) there is also a Digital Methods book (MIT Press, 2013) as well as a complementary Issue Mapping book (Amsterdam University Press, 2015), and other digital methods publications. We are using the #DMI18 hashtag as the backchannel for communication (to use a throwback term for Twitter usage). Some pictures from Winter School 2015. Here is the Facebook Group from one year, and from the last Summer School. 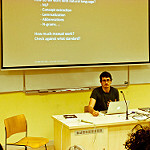 Here are pictures from a variety of DMI Summer and Winter School flickr streams.